At the Upper Wood Street CCD we came across a blog post on Venture Woods, informing an Angel Investor Event happening on the 21st of this month. During this OCC meet we crowd-sourced a template to crowd-source at least one business plan at the next OCC and present it to the event. - Following this, we will give you a proposed flow (which we formulated right now!). Each group can tweak it and carry on with forming their b-plans! So, that’s it! Let’s meetup on this Wednesday at 2 PM! We will start off with the crowd-sourcing at 3 PM, and would suggest you to be at CCD RDB Boulevard by 2:30. If you have any suggestions, just shoot on the mailing list! We are looking for experienced developer who can work in a distributed team environment. Pay is very good to say the least. We will prefer someone from Kolkata so (s)he can work from my place if needed. Kolkata had another splendid OCC, on Sat Aug 29. We did have some glitches, with the Internet not working at the Park Street CCD venue. And since Park Street CCD has much footfall we had to shift out to a bigger CCD. The manager at Park Street suggested a few nearby and then Mitesh and Manish went out searching for one. At last we found the CCD on Upper Wood Street. If you are coming from Park Street (like we did) then just walk across 22 Camac Street (Pantaloons) and you will find a crossing, keep going straight, and you will find a CCD on your right. That will become our permanent CCD venue for South Kolkata. It has a great outdoor arrangement, simple superb for the coming season. Sorry for having forgotten the last names of a few people. And I can not recollect the guy from BITS. Someone please tweet the name(s). Instead of the initial venue change, etc. we had a very good time. Me and Mitesh could start on the project he is to work on. I gave Ashmita an introduction to HTML. Prachi, Pankaj and me discussed celeb9.com and then a lot of scaling related stuff. Both start at around 2PM and continue till 9-10 PM. So you can pour in after office. Remember to bring in your laptops, mobile devices, notepad. Meet, discuss, work! Oh and drink coffee (not free :P). What came out of this? Well Sumana got freelance creative writing work! Yay! I came out with the name for a venture that Pallav and Abishek are coming up with. Its a secret... shhhh. But we will have a good party at one of the future OCC where they have promised to sponsor a (huge) cake. Lovely! Me and Mitesh discussed a new project he will be working on with me. We had some serious work done, awesome fun and I had my lunch (chicken burger) at 5 PM! So what are you waiting for? Pour into the coming OCC @ CCD Park Street, Sat 29 Aug. 11 AM onwards. (opposite KFC). You are welcome to come in anytime after 11AM. Bring your laptops, blackberrys / iphones or even your notepad. Sit and draw if you want. Its up to you. Kolkata meets, discusses, shares and gets work done. Oh btw in the next OCCs I will be looking out of freelance programmers, PHP and JS. Others are also looking out of talent. Many content work coming in... so creative writers, bloggers should join in! Lets ROCK Kolkata! (and get a lot of work done over coffee). Note: We are looking out for some mobile broadband company to sponsor the events broadband connection. Currently we are running on something I use, plugged into my wireless router. But we need a better solution. So sales heads from the fiercely competitive mobile/broadband companies, here is your chance to prove your product. Webhosts like GoDaddy and other similar often limit how much you can import with the online control panel (phpMyAdmin in most cases). So here is a simple PHP script that does this for you. You have to take a mysql dump from your database. Upload it to you host. line 2: mysql_connect( ) parameters: Database host, username, password. line 3: mysql_select_db( ) parameters: Database name. line 4: fopen( ) parameters: path and name of you SQL dump file. What I have done is simply read the dump line by line. Lines starting with -- or /* are considered comments and left out. Now we need to build full SQL commands which span across many lines in the dump. So we check for the end semicolon (;) and until we find one we just join the lines together to get one SQL statement. Once done we execute it and move on to the next. If you find any errors please comment. Also if you port this to use PostgreSQL or use other programming languages please share your code's link on this post's comment. If you have come this far then I can assume you have an Amazon account, Firefox, Elasticfox extension on it. If not, well then you should get them to do this yourself or else just read through! Lets open Firefox and from the Tools menu on top you should see Elasticfox. On clicking it you should see a pretty detailed interface and a dialog box asking you to fill in your Amazon credentials. Go ahead and do that. Basically it needs a name (like a nick name, just for you to refer to that account), the Amazon Key, and Secret. The last two are string that you will find here after you login with your AWS account. Now if that step is done we should be able to select our new Amazon profile name in Elasticfox (at the very top center in the Elasticfox extension's UI). Done. Now you will see many tabs in Elasticfox. They are Instances, Images, KeyPairs, etc. Right now we are only interested in the KeyPairs tab. Click on it.You should see a blank list unless you already have created a key for yourself. Anyways for our purposes we will use the small green icon which says "Create a new keypair". We will need to give a name for this, say "brainless". What happens now is that Amazon creates a keypair for us, and sends the private part of the keypair. If all goes well Elasticfox will let us save the private part of the keypair (named "id-brainless" if we used "brainless" for the name of the keypair). Now we have a keypair. If you have no idea about this keypair thing, well just do a search on it, like here. Now in Elasticfox you see the tabs again. This time we need the Images tab. Click on the refresh button in the Images section. It will fetch a list of all images available at that moment. These images are basically like Live CD/DVD mediums. You use them to boot your own instance. Now there is plenty of choice here and you can make your own custom image too. You will notice a small search text box near the refresh button. Type in nginx. You should get an AMI with this AMI ID: ami-6138dd08. Notice that there is a Manifest name, which is pretty explanatory for many AMIs. Same for this one. It should say "ami.yyang.info/gentoo-nginx-php-mysql-06feb2008.manifest.xml", which means it comes with nginx, PHP and MySQL setup. Instance Type (basically this defines how powerful a server you need, refer here). We choose m1.small here. Minimum number of instances (in case you want more than one server or instance started at once). We keep this as 1. Maximum number of instances (what is the maximum number of instances that Amazon should try to start at once). We keep this as 1. KeyPair (choose the brainless key here, the one we created just above). Just notice that in the Security Group section there is a "default" group in which this new instance will launch. This is the default parameter. We will come to this part soon. Now click on Launch and pray! Well not really. Unless something is really wrong or Amazon is out of empty instance slots (very unlikely) you will have a shinny new instance all to yourself, with a fresh Gentoo booting on it as you are reading this! Now notice the very important thing here. You did not do to a website to sign-up for a new server and got it in a few hours or maybe a day. Rather this is all through an API. In our case Elasticfox is consuming the APIs and we are using the GUI of Elasticfox. Later we will see the actual API and deal with it a bit to get an idea. And at an even later point I intend to blog on how to use Tarzan PHP AWS library to write a small scaling platform for your website. Yes auto scaling! Wallah!!! Lets not get carried away though. So back to our instance. Where is it? Simple, check the Instances tab. You will notice a new row there with a lot of details. The most important one right now is State which I am sure you understand already. Well it simply tells what state the server is in: running, or pending (booting up), shutting-down, terminated (shutdown complete). Refer here. Its the last two points we are interested in right now. Getting a better hosting account is easy if you have shared hosting account. If you have a dedicated server or a vds (virtual dedicated server) this is still easy task. But you may have to wait each time you want to upgrade your web server because it takes time to setup. Thus you need to plan ahead and take extra hardware so then when there are abrupt website peaks your site does not stop working. Now since we are discussing EC2s which are like dedicated pieces of hardware we will assume the website does not run on shared hosting. So we are comparing with dedicated hosts or vds. Now getting extra servers is easy to say, but it costs if you want to predict usage (a digg effect, slashdot) and get extra servers. Also how much usage will you get? These maybe difficult numebrs to predict. It would be a lot easier if you could get servers when you need then, no hassle of installing you full software stack, and get it ready in a few minutes. Seems like the heaven of web serving? Well that is what EC2s are all about. To start on what EC2s do in detail and how to use them from PHP (and other languages) its good to first read on Amazon's details about them (taken from their EC2 page, I was tired :P). Create an Amazon Machine Image (AMI) containing your applications, libraries, data and associated configuration settings. Or use pre-configured, templated images to get up and running immediately. Upload the AMI into Amazon S3. Amazon EC2 provides tools that make storing the AMI simple. Amazon S3 provides a safe, reliable and fast repository to store your images. Use Amazon EC2 web service to configure security and network access. Choose which instance type(s) and operating system you want, then start, terminate, and monitor as many instances of your AMI as needed, using the web service APIs or the variety of management tools provided. Determine whether you want to run in multiple locations, utilize static IP endpoints, or attach persistent block storage to your instances. Pay only for the resources that you actually consume, like instance-hours or data transfer. Lot of you may have heard of this. Well certainly you have heard of Amazon.com and if you are into software/IT/web there is a good chance someone in your company is thinking of that mumbo jambo called cloud computing. Well what the hell is all this and then this web services? I need to host this blog. I can take a shared hosting account which will allow me to run a site on a server that is being shared among many other users. Each user is running from his/her own folder. Each having maybe a few MySQL or similar database server users. Some hosts will allow to use a custom .htaccess file in your folder to use custom re-write rules etc. under Apache. Now that seems a headache for a site which is just running a blog? Well take an account from WordPress.com or Blogger, LJ, etc. These are the hosted options. I could also take a full dedicated server or a virtual server if I need, but I will to maintain it myself. Also getting a fully dedicated server setup takes sometime (1 day or more). The last option is that I take a cloud service. What I get is an independent slice like in a virtual dedicated host. But its more. A basic cloud service should give me access to the service fast. So a new slice fitted with 1GB or RAM/X Ghz of processor etc. should be up in just a few minutes maybe. This is same in vds. The most important part: all the setup, settings should be available through APIs. What was that? Well I should have a simple protocol (mostly http based) which I or my custom code or some app can access to create a new slice, or get a bigger slice if available, check status, and maybe other stuff. That is the most important part. The ability for software itself to create its own environment to run on! Confused? Even I am :P ... well don't worry, I will explain. Now there are many examples of cloud services, but I have (sadly) enough exposure in just one: Amazon Web Services. So lets dig into it. This is our primary service and we will inspect this first. In brief this is the service that allows you to get a server (hardwarde + software full stack as needed) up and running in little time, assign an IP address to it, set firewall and invite users to the website. Well except for the invite part the rest are all provided by Amazon and over an API. So my PHP code coulf do that! Of course I will be billed for it. Just store whatever you needed, setup access rules, and forget about it. Simple! This of these as the equivalent to you local post offices. So you do not need to go to the city central post office to fetch something. Local distribution of data! Its fast way to get things to the audience. Well there are other services but I am not as good with them. When I experiment/use them enough I will blog on them. It's been a long while since I got lost. Well personal, professional and all other kinds o nals. But its good to be back. Have been doing a lot of Amazon WS these days, so will blog about them. Think I will start a series on Amazon WS with PHP. Oh ! and we shifted to Gentoo / nginx. Good combo. Will blog on that too. Writing after a really long time. Just doing my usual work stuff when I suddenly found search on Google has changed. 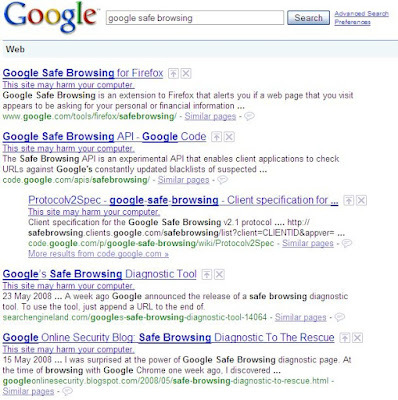 Almost every other site on the web is now unsafe to browse. Even Google itself.